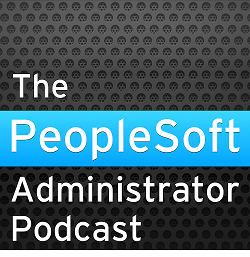 PeopleSoft’s Mobile Synchronization Framework is designed to support off-line access to a subset of the PeopleSoft application. Application Designer has been able to generate database triggers to maintain Timestamp and System ID fields on tables that support synchronization of mobile clients since PeopleTools 8.44. In 8.48 it is now possible to set column defaults on character and numeric fields via Application Designer. However, this has potential for much wider application in PeopleSoft applications. There are two new checkboxes on the record properties dialogue box. If the User -> Server box is checked, Application Designer will add column defaults to the fields in the generated create and alter table DDL. As an example, I created the following record in Application Designer. And this was the DDL that Application Designer generated. • All of the numeric and character columns now have default values, but none of the date columns have defaults. I assume that this is because it is platform specific, but then so is the rest of the field list. There is another problem to using the Up Sync check box. When checked, you are prevented you from making a field required. The unchecked box is greyed out, but fields that are already required remain so. I think that the ability to specify column defaults could have advantages during batch processing. All numeric and character columns in PeopleSoft (with minor exceptions) are NOT NULL in the database. Thus, if a process is inserting a row into that table, it must provide a value for every mandatory column. Otherwise, you generate an Oracle error. Specifying a default value will prevent this error. It would also save developers from having to add this default values to their code, thus simplifying development and maintenance. Many batch processes in PeopleSoft process working storage or reporting tables. Often they insert rows, filling in key and some other columns, and then update other columns later on. If these columns have defaults they do not need to be referenced in the insert statement. When a new column is added to a table, it is necessary to find every place where a row is inserted, and add a value. Specifying a column default would save adding a space or zero to those inserts. "I assume that this is because it is platform specific, but then so is the rest of the field list." you said. Did you do the test in other platforms, such as, SQL Server?